L-istorja dwar Egrant Inc. ilha sena fl-aħbarijiet. Ilha tinħema 4 snin minn ftit wara l-elezzjoni ġenerali tal-2013 meta twaqqfet flimkien ma kumpaniji oħra. L-ewwel kellna lil Konrad Mizzi bil-kumpanija tiegħu Hearnville Inc.. Ftit wara Keith Schembri bil-Kumpanija tiegħu Tillgate Inc.. Ħin minnhom daħal fl-istorja Adrian Hillmann tat-Times of Malta ma kumpaniji oħra fil-Panama u f’postijiet oħra. Hillmann kien l-uniku wieħed s’issa li irriżenja (jew ġie mġiegħel jirriżenja). L-istorja, kif bla dubju tiftakru, saret waħda pubblika wara li nkixfu l-Panama Papers. Miljuni ta’ dokumenti sigrieti dwar diversi kumpaniji imwaqqfa minn persuni pubbliċi u privati madwar id-dinja kollha ma baqawx iktar sigrieti. Inkixfu u tperrċu mal-erbat irjieħ tad-dinja. Il-qalba tal-problema mhiex il-ħolqien tal-kumpaniji imma l-iskop li għalih dawn jitwaqqfu. Kumpaniji sigrieti, kif għidt f’artiklu ieħor ma jinħolqux biex fihom jitfaddlu d-domni jew is-santi. Dawn il-kumpaniji jitwaqqfu biex fihom jinħbew flejjes u assi oħra min għajnejn l-awtoritajiet. Dan il-ħabi jsir għal żewġ raġunijiet : biex ikun evitat il-ħlas tat-taxxi, u/jew biex jinħeba l-frott tal-korruzzjoni. Tnejn mill-kumpaniji ilna nafu ta’ min huma. Ta’ Konrad Mizzi u ta’ Keith Schembri. Inkixfu kmieni u kien għadu ma sar l-ebda użu minnhom, skond kif kien intqal dakinnhar. Kienet inkixfet korrispondenza dwar il-possibilitá ta’ ftuħ ta’ kontijiet ma diversi banek. Kien hemm diversi tweġibiet kompromettenti li, iżda, Konrad Mizzi u Keith Schembri dejjem ċaħdu li kellhom x’jaqsmu magħhom jew inkella li kienu inħarġu fuq struzzjoniiet tagħhom. Ftit kienu twemmnu. Il-polemika baqgħet għaddejja u l-attenzjoni ċċaqalqet lejn it-tielet kumpanija : Egrant Inc. Ta’ min kienet din? Niftakru li imkien fil-Panama Papers ma kien hemm l-iċken informazzjoni dwar is-sid jew is-sidien ta’ Egrant Inc, għax kien intqal li din l-informazzjoni kienet ser tgħaddi bil-fomm fuq Skype. Il-messaġġ kien ċar, mill-ewwel, li l-probabbiltá kbira kienet li kien hemm xi persuna jew persuni importanti ħafna involuti. Importanti iktar minn Konrad Mizzi u Keith Schembri, jiġifieri. Ma kienx hemm lok għall-immaġinazzjoni. L-ismijiet possibli kienu limitati ħafna u l-ismijiet probabbli kienu fuq fomm kulħadd! In-nies ilhom jitkellmu dwarhom! Nhar il-Ħamis infetaħ kapitlu ieħor. 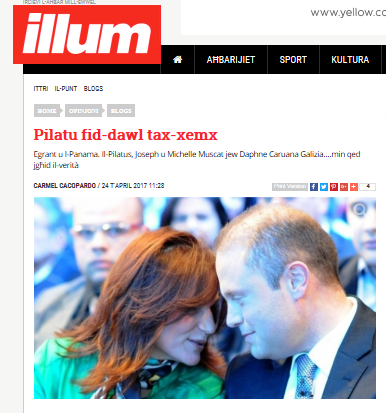 Fuq il-blog tagħha Daphne Caruana Galizia irreferiet għall- dokumenti li skonta qegħdin fis-safe tal-Pilatus Bank u li minnhom jirriżulta li l-kumpanija Egrant Inc hi ta’ Michelle Muscat u li din il-kumpanija irċeviet diversi flejjes mill-Azerbajġan, l-ikbar waħda minnhom somma ta’ $1.017 miljun li waslet mingħand bint Aliyev. Mil-livell ta’ dettall ippubblikat hu ċar li d-dokumenti interni tal-bank huma s-sors tal-istorja. Il-Ġimgħa fil-għaxija ġiet ippubblikata informazzjoni dwar ċertifikat ta’isħma f’liema ċertifikat qed jingħad li l-kumpaniji Dubro Limited S.A. u Aliator S.A. għandhom f’idejhom ishma tal-kumpanija Egrant u dan f’isem is-Sinjura Michelle Muscat. Imma d-dokumenti infushom li minnhom qed ikun ikkwotat s’issa għadhom m’humiex ippubblikati. Ma nafx għaliex. Hemm bżonn li jinħarġu għad-dawl tax-xemx id-dokumenti kollha li fuqhom hi ibbażata l-istorja. Dan hu neċessarju għax dak li qed jingħad hu ikkontestat. Għalkemm din l-istorja ilha tinħass ġejja, xorta meta ġiet tinħass iebsa ħafna. Hi ta’ gravitá kbira u tista’ tkun dak li jispjega l-għaliex Konrad Mizzi u Keith Schembri ma tkeċċewx is-sena l-oħra meta ħarġet l-aħbar li kellkom il-kumpaniji sigrieti. Ta’Pilatus caħdu kollox, bħalma għamlu tan-Nexia BT u ovvjament Joseph u Michelle Muscat. Bosta huma konvinti mill-veraċitá tal-istorja. Imma li tkun moralment konvint li l-istorja hi korretta mhux biżżejjed. Din l-istorja teħtieġ il-konferma li tiġi mill-provi tad-dokumenti u mhux mid-dimostrazzjonijiet. Għax fuq id-dokumenti hi mibnija. Allura hemm obbligu li dawn id-dokumenti tant bażiċi jaraw id-dawl tax-xemx. The Egrant Inc. story has been in the news for the past year: it has been developing for over the four years since the 2013 general elections, when it was set up together with other companies. First we had Konrad Mizzi with his company Hearnville Inc. Then we had Keith Schembri with his company, Tillgate Inc. The matter became public when the Panama Papers were disclosed. Millions of hitherto secret documents about companies set up by public and private individuals all around the globe were made public. The core of the issue is not the setting up of the companies but the objectives for which they were set up. Secret companies are normally set up for the concealment of financial and other assets in order to avoid the taxman or to conceal the fruits of corruption. The owners of two of the companies are already known. One of them is Minister Konrad Mizzi while the other is the Prime Minister’s Chief of Staff Keith Schembri. Their identity was disclosed over 12 months ago, when it was declared that their Panama companies had not yet been put to use. When the Panama Papers were published it became known that correspondence with several banks had been exchanged relative to the opening of bank accounts for the said companies. Requests and commitments were spotlighted but Konrad Mizzi and Keith Schembri disclaimed any association with this correspondence and commitments identified. No one believed them then. The polemic went on and the focus shifted towards the third company: Egrant Inc. Who was its ultimate beneficial owner? We should remember that the Panama Papers did not shed any light on the identity of the owner or owners of Egrant Inc. because this information was never communicated in a written manner: it was communicated over Skype. The message conveyed was immediately clear that in all probability some big-head was involved and that he or she was more important than Konrad Mizzi or Keith Schembri. There was no room for imagination as the possible names were limited in number with the actual names being on the tip of everyone’s tongue. On Thursday, a new chapter was opened. Daphne Caruana Galizia, on her blog, referred to documents that she said were in the safe of Pilatus Bank. These documents identified Michelle Muscat as the ultimate beneficial owner of the company Egrant Inc. It was also stated that this company received money transfers from Azerbaijan, including the sum of $1.017 million on the instructions of the daughter of Azerbaijan’s President Ilham Aliyev. The level of detail described by Daphne Caruana Galizia’s blogpost indicates very clearly that this was based on the contents of bank documents. On Friday evening, additional information relating to a certificate of trust was published. This information, the validity of which was contested by Joseph Muscat, states that the company Dubro Limited S.A. and Aliator S.A. hold shares in the company Egrant Inc. on behalf of Mrs Michelle Muscat. But the documents from which this information is being extracted are still unpublished. I do not know why this is so. It is necessary that these documents, fundamental to the issue under consideration, see the light of day. This is essential because the information published is being contested. The information published is serious stuff. It may be the reason why Konrad Mizzi and Keith Schembri were not dismissed from office last year when the Panama Papers were published. Pilatus Bank, Nexia BT, Joseph and Michelle Muscat have denied the published information. Many are convinced on the veracity of the story, but being morally convinced is not sufficient. Proof only results from authentic documentation but certainly not from demonstrations. It is for this reason that the full disclosure of all the documentation on which the published information is based is an essential prerequisite. Għadu kmieni biex wieħed jifforma opinjoni dwar kemm il-Bank ta’ Pilatus kien qed jirriċikla l-flus maħmuġin mal-erbat irjieħ tad-dinja f’isem il-klijenti tiegħu. Dan minħabba li l-fatti, dejjem jekk seħħew, s’issa la ġew spjegati biżżejjed u l-anqas sostanzjati fil-pubbliku. Allegazzjonijiet isiru l-ħin kollu imma ftit ikunu sostanzjati. Meta dawn il-provi ma jkunux imperċin dan ikun ifisser jew li ma seħħux kif intqal, inkella li dawn il-provi ser jibqgħu kunfidenzjali għax ikun meħtieġ li jkun protett is-sors tal-informazzjoni. Il-gravitá tal-allegazzjonijiet bil-fors tqajjem punt interogattiv dwar jekk dak li jkun qed jintqal hux minnu jew le. Avolja qegħdin fi żmien li ma tantx ser nistagħġbu jekk dak allegat seħħx verament. 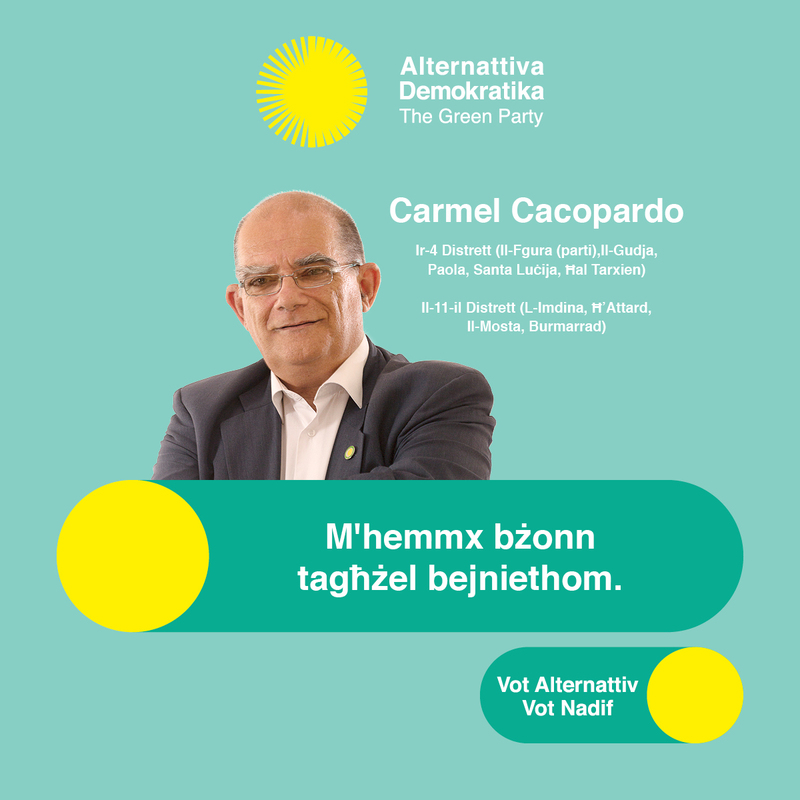 Nafu li t-tmexxija tal-Ażerbajġan hi waħda minn l-iktar korrotti fid-dinja u għalhekk anke l-fatt biss li pajjiżna qed jidher viċin wisq ta’ dan il-pajjiż hu minnu innifsu ta’ tħassib. Bħalma hu tad-daħq, jew forsi aħjar tal-biki ż–żjarat spissi tal-Ispeaker tal-Parlament Malti f’dan il-pajjiż fejn spiss smajnieh jgħidilna kemm hu demokratiku u trasparenti Aliyev. Ovvjament dawn iċ–certifikati ta’ Anglu Farrugia ftit jikkonvinċu nies dwar Aliyev, imma bla dubju jixħtu dell konsiderevoli fuq dak li Mr Speaker jifhem b’demokrazija u trasparenza. Huwa f’dan il-kuntest li wieħed irid ipoġġi dak li qed jintqal. Għax pajjiżna jidher li dieħel fl-industrija tar-riċiklaġġ. Mhux dik assoċjata mal-ħarisen tal-ambjent imma l-prodott tal-korruzzjoni.